Today I got a shipment of electronics. Me and my little girl were both excited to open a bunch of envelopes to see what's inside; we have been waiting for some more Arduinos and mechanical switches for our upcoming Electronic Instrument. She immediately recognized the Arduinos, of which I was kinda proud. The switches were a disappointment though. Colorful and all, but unfortunately of the "latching" type, meaning a switch that stays down when you press it, and comes back up when you press it again. And that just won't do if you're planning to build a keyboard for a musical instrument, will it? 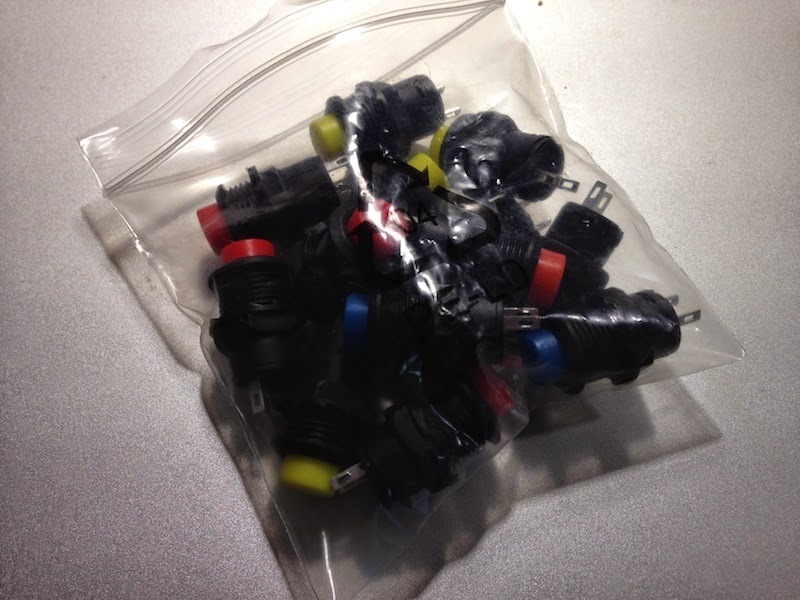 So, we started "modding" the switches be removing certain parts from inside. We had 15 switches to mod in total so there was some real work to do! You'd thing this would be tedious and boring for a 6-year old girl? Nope, not at all. Even the 3-year old helped the best she can. In the end, I was the only one (not counting the 3-year old in) unable to open the plastic casing of a switch without breaking it. So the 6-year old can now mod a switch without any adult help, and does it better than me... And here they are, all 15 switched, modded by willing child labor! Then we did some design on how the instrument would look like. Next up: woodwork. We need to build a casing for our thingie. And maybe we need to visit the local "recycling center" to scavenge some parts, including a little speaker element. The Hartke element might be a bit too heavy-duty for our use case, weighing 1 kg or so. You can see it in the picture too. Quite a monster, ain't she? Today her older cousins were visiting. She organized a Soldering School where she explained how to solder and had them all do some basic soldering. Was fun. Yesterday she was sick and I got to spend the whole day at home with her. Guess what we did? Well, she slept and watched Netflix while I was working. For a while. But when she got her energy back, guess what she wanted to do. Solder. So we did some serious soldering. 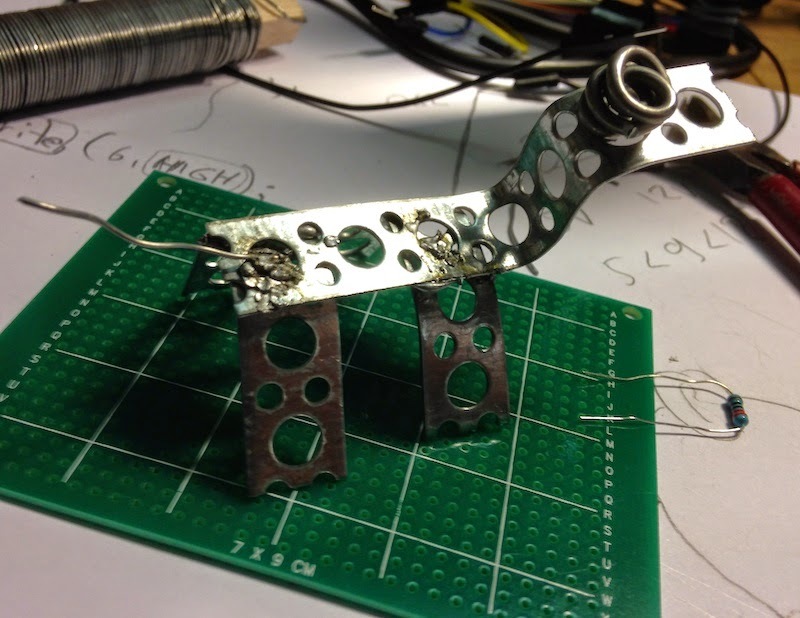 Behold the METAL HORSE! And today, I asked her to do her violin homework. Guess what she wanted to do. Solder. So solder we did. She soldered a resistor on the perfboard perfectly! Yesterday she asked me if we could now build the magical electric instrument together. The one we discussed in Lesson 65. I said yes. So we started by recapping on our previous work with electricity. 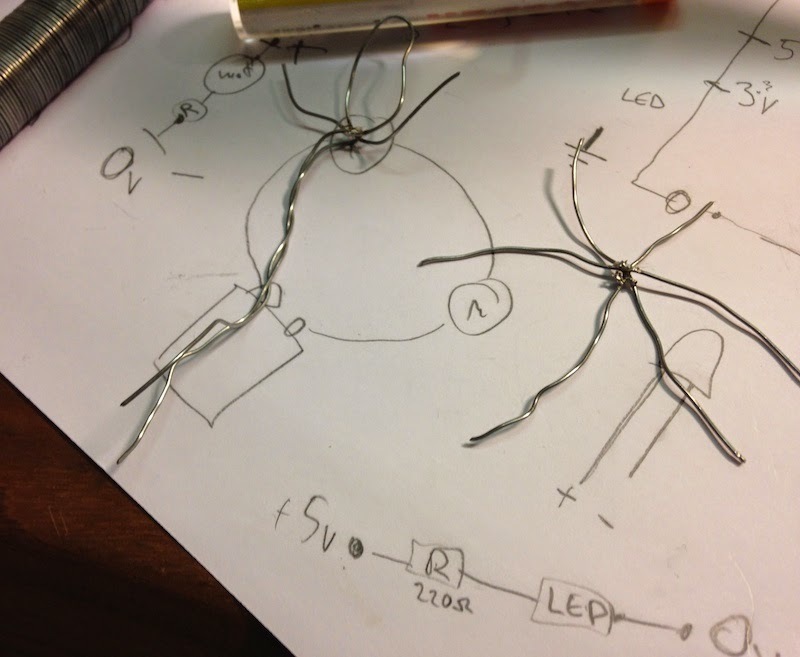 She struggled with terms (voltage etc) but with some help, she was quickly able to construct a circuit that will light up a led with 3.3 volts from the Arduino. And she remembered that you cannot use 5 volts for that. Soon we were about to start connecting the speaker element to the board. Whoa! One of the wires soldered to the speaker had gone missing. We concluded that we're gonna have to solder it back. Now this speaker element is heavy-duty and has a magnet so powerful that when it gets stuck to a piece of metal, she can barely drag it free with all her might. Now imagine using a soldering iron on that. It'll do its best to draw the burning-hot iron to the speaker element. So we decided I'll do the soldering but she'll get to practice soldering after that. 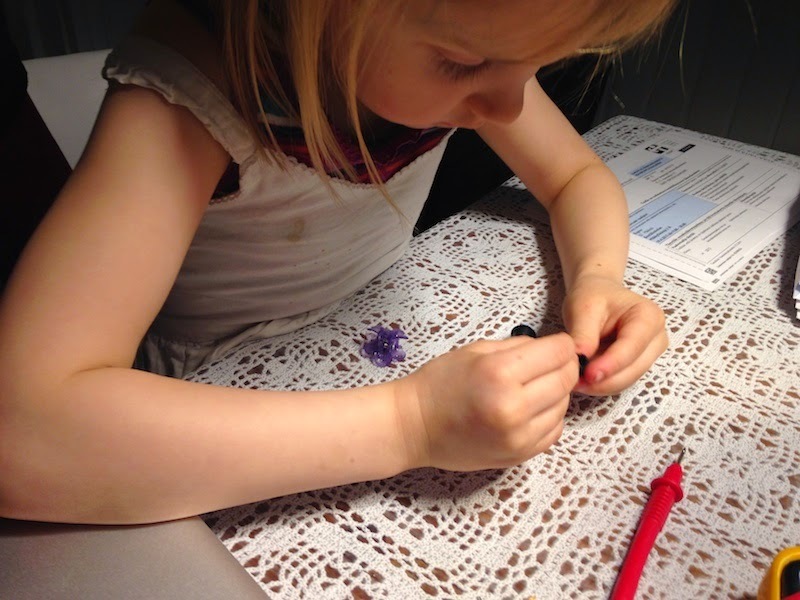 She helped me by keeping the wire in place with her steady little hands while I applied solder. 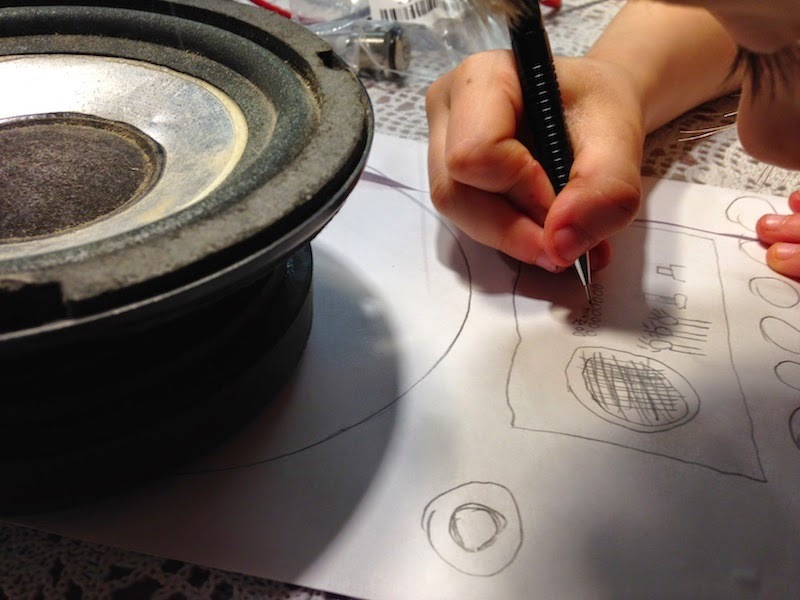 After fixing the speaker I let her do some free practice with the soldering iron, under my supervision, of course. She started by almost burning the power line of the soldering iron. After I showed her the burn-marks on the plastic cover, she took good care not to repeat that mistake again. Here are some of here works. A stickman and a star that is. 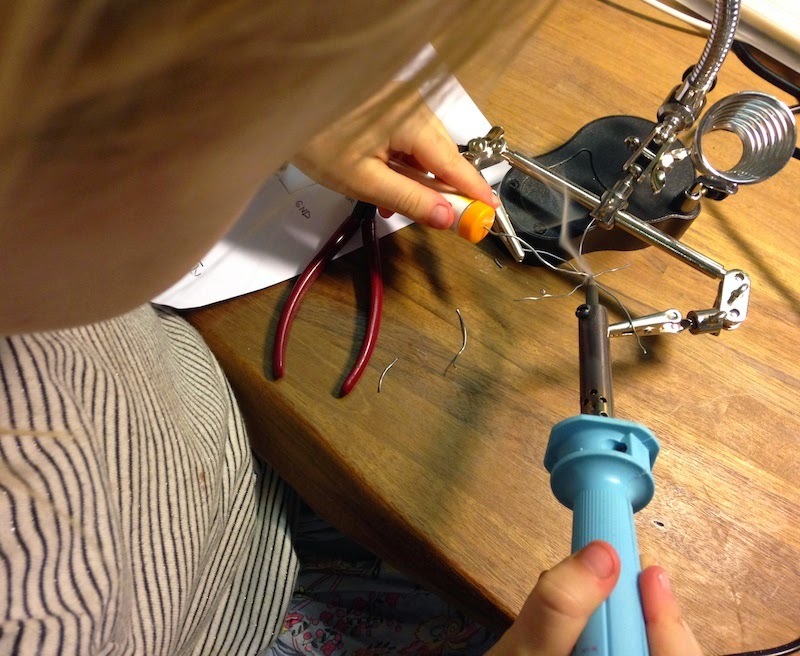 She wanted to keep on soldering but it was almost bedtime so we had to stop for now. Was fun! I think need a better soldering iron though. Mine's a 5 dollar one from the Internet.